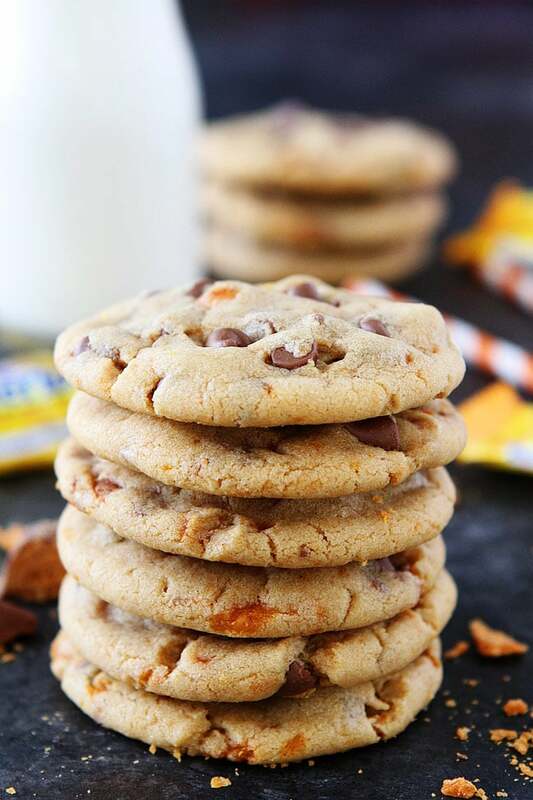 Peanut Butter Butterfinger Cookies-soft peanut butter cookies with Butterfinger candy bars and milk chocolate chips! Use your leftover Halloween candy to make these delicious cookies! Halloween is tomorrow, I hope you have your costumes and candy ready! Our boys are super excited and can’t wait to go trick or treating. 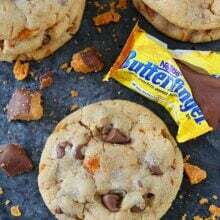 I am looking forward to sneaking into their candy bags to find Butterfinger candy bars so I can make Peanut Butter Butterfinger Cookies. They are the perfect cookies for using up Halloween candy. 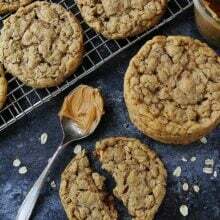 My soft peanut butter cookies are one of my all-time favorite cookie recipes. They are perfect in every way. I decided to use my favorite peanut butter cookie recipe to make Peanut Butter Butterfinger Cookies and it was a good idea. Actually, the BEST idea. These cookies are crazy good! 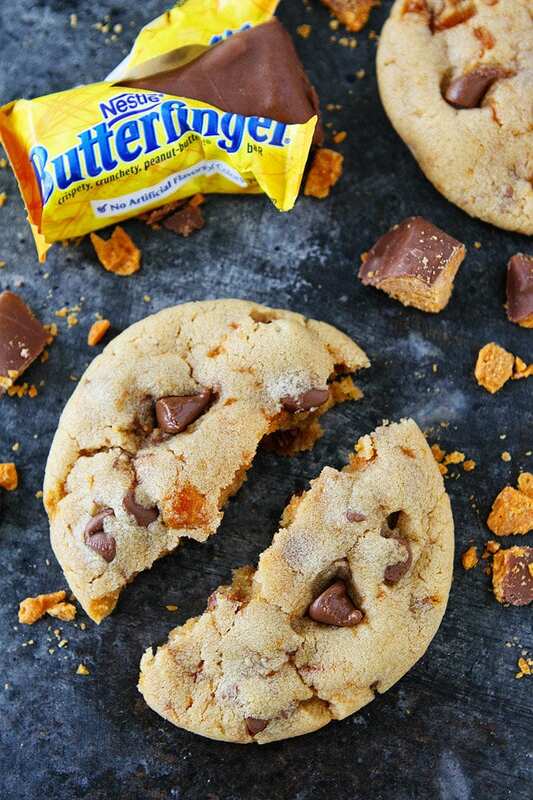 And to be honest, I don’t even really like Butterfinger candy bars, but put them in peanut butter cookies and I am ALL in! 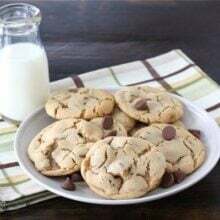 The cookies are soft, chewy, with pieces of Butterfinger candy bars and milk chocolate chip cookies. I normally use semi-sweet chocolate chips in my cookie recipes, but milk chocolate chips are the way to go in this peanut butter cookie recipe. They go so well with the Butterfinger candy bars and peanut butter cookie. Trust me! 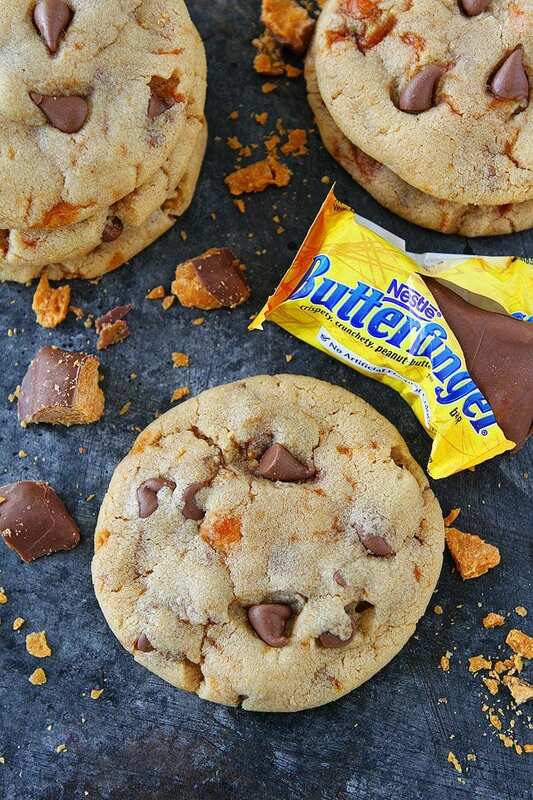 Gather up all of the Butterfinger candy bars you can find and make Peanut Butter Butterfinger Cookies. 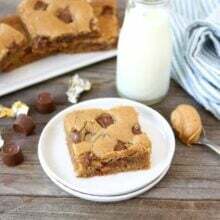 Everyone loves these soft peanut butter cookies with Butterfinger candy bars and milk chocolate chips. A great way to use up leftover Halloween candy! With the mixer on low, slowly add in the dry ingredients. Mix until just combined. 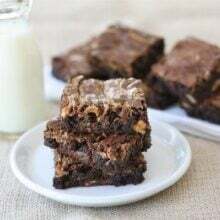 Stir in the chopped Butterfinger candy bars and milk chocolate chips. Take about 2 tablespoons of dough and form a cookie dough ball. Place cookies on prepared baking sheet, about 2-inches apart. Slightly press down on the cookie balls with the palm of your hand. Bake the cookies for 10 minutes or until they are golden at the edges and just set. Don’t over bake, the cookies will set up as they cool. Remove pan from oven and let cookies cool on the baking sheet for 4-5 minutes. Transfer to a cooling rack and cool completely. Yum, these sound great! Butterfingers are one of my favorite candies, so I love incorporating them into recipes whenever I can! I actually have a ton of crushed homemade Butterfinger bars that I used for making Butterfinger frosting (incredible). These cookies would be a great use for them! I will eat all your unwanted Butterfingers – and these cookies too! Yum! Oh! Butterfingers are one of my favorite Halloween candies. So I’ll definitely be baking up a batch of these cookies! One of my fav candy bars and of course in a cookie..duh!! OMG these look SO good!! I love butterfingers, PLUS cookies??!!! yessss. now that’s how you make use of leftover halloween candy! YUM! Such a yummy way to eat all that Halloween candy!! I’m going to buy more candy just to make these! All hail the cookie queen! Just made these with leftover Halloween candy. They were so good! The kids loved them! Butterfingers are my favorite!!! This sounds delish! I went out tonight, two days after Halloween, to purchase butterfingers! These sound delicious! I am not a candy person but in cookies they sound delicious. Also purchased a bag 70% off.